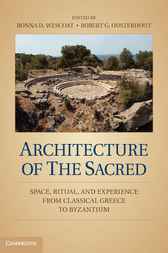 In this book, a distinguished team of authors explores the way space, place, architecture, and ritual interact to construct sacred experience in the historical cultures of the eastern Mediterranean. Essays address fundamental issues and features that enable buildings to perform as spiritually transformative spaces in ancient Greek, Roman, Jewish, early Christian, and Byzantine civilizations. Collectively they demonstrate the multiple ways in which works of architecture and their settings were active agents in the ritual process. Architecture did not merely host events; rather, it magnified and elevated them, interacting with rituals facilitating the construction of ceremony. This book examines comparatively the ways in which ideas and situations generated by the interaction of place, built environment, ritual action, and memory contributed to the cultural formulation of the sacred experience in different religious faiths.